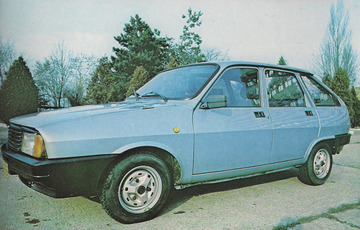 The Dacia 1325 (also known as 1325 Liberta or simply as Liberta), was a car manufactured by Romanian auto marque Dacia. Produced from 1991 until 1996, Dacia 1325 was the hatchback version of the third generation Dacia 1310 (1989–1993), as well as the hatchback version of the fourth generation 1310 (1993–1998) and the successor of Dacia 1320 (1987–1990), which was the hatchback version of the second generation Dacia 1310 (1983-1989). At first it was just a copy of the old 1310, but in 1993 underwent a facelift similar to 1310's facelifting the same year and stayed in production until 1996.